Control plug-ins from a single user interface. Define the point where audio processing takes place in a flexible manner. vxPlug consists of 2 plug-ins: vxPlugControl and vxPlugClient. 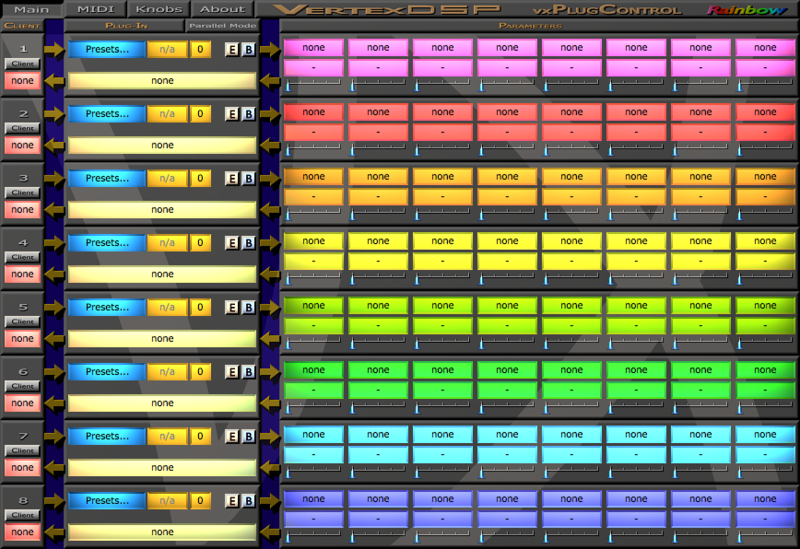 vxPlugControl loads VST plug-ins and controls their parameters. Host parameter automation and MIDI are supported. Click the image above for a screenshot of vxPlugControl. You can route audio through vxPlugControl and through selected plug-ins. In this configuration, vxPlugControl works like a chainer. vxPlugControl also supports parallel processing. Alternatively, the point of processing audio in your host application can be defined by vxPlugClient. Every instance of vxPlugClient is able to send and receive audio data to/from vxPlugControl. Within vxPlugControl, the audio data is routed to plug-ins you have loaded before. Both routing options can be mixed (switchable for every plug-in). To minimize screen usage, vxPlugControl offers a small Knob Page. You can use up to 16 instances of vxPlugControl and up to 128 instances of vxPlugClient. vxPlug is VST 2.4 compatible. Use your favorite track EQs during mixing while controlling the EQs from one single user interface. To measure the results in realtime, MultiInspector will be of great help. vxPlug in combination with MultiInspector works like an advanced multitrack EQ with spectrum analyzer. Check audio effects at different points in the effect chain of the host application by simply switching the audio connection in vxPlugControl. No effect unloading and reloading needed. Setup measurement points in the effect chain and switch between them. Hosting of VST effects and VST synths. Chaining of plug-ins in vxPlugControl. Parallel processing mode in vxPlugControl. Optionally defining the point of audio processing in the host application via vxPlugClient. Support for resizing of plug-in GUIs. Mapping of up to 8 parameters per plug-in in vxPlugControl. MIDI support and routing options for loaded plug-ins. MIDI support for parameters of vxPlugControl. Small knob page for minimal screen consumption. Up to 128 instances of vxPlugClient. Up to 16 instances of vxPlugControl. VST 2.4 compatible host software. VST 2.4 compatible host software. Universal Binary, PowerPC and Intel supported. "It's a really cool tool, a must have!" "GREAT plug... man you guys come up with some really cool ideas!" "Very intelligent and intuitive design." 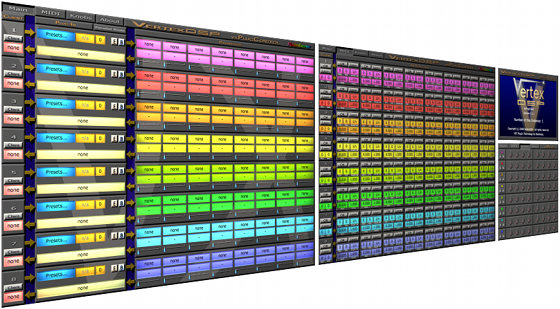 •	Hosting of VST plug-ins with more than 2 inputs does not lead to a crash anymore. •	New parallel processing mode in vxPlugControl. •	The bypass switches in vxPlugControl can now be assigned to MIDI input. 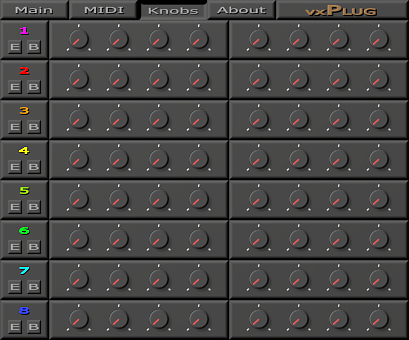 •	The small Knobs page of vxPlugControl now contains switches for editor and bypass. •	The number of the current instance of vxPlugClient is shown with a larger font. •	Possible crash when routing audio to an empty slot under certain circumstances. •	vxPlug is now able to load VST synth plug-ins, besides VST effects. •	Direct MIDI support for loaded plug-ins. •	MIDI support for mapped parameters in vxPlugControl. •	Improved GUI of vxPlugControl with new rainbow color scheme. •	For minimal screen usage: New small Knobs page in vxPlugControl. •	Improved handling of plug-in windows. •	Support for resizing of plug-in windows. •	The last position of the plug-in windows is restored. •	Preset names of loaded plug-ins are now displayed correctly. •	One pixel offset of Main and About switch fixed. You can find the latest release notes here.